There are countless staff here at SUSU, working constantly to serve you and behind the scenes and ensuring that your students’ union runs at its absolute best. These staff range from student staff on the bars right up to the Sabbatical Officers, as well as full-time staff in the offices. 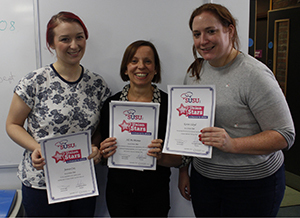 To celebrate all the hard work they put in, SUSU rewards Union Stars – those who have gone above and beyond in achieving the best for the union and truly work towards our mission statement.